When fruit was not in season, Southern cooks pulled out dried fruits like peaches or apples to make quick fried pies for dessert. With the sweet succulent taste of peaches, these "Jacks" are the perfect treat. Make filling the day before you cook jacks. Simmer peaches and water in a small saucepan for 45 minutes to an hour until peaches are soft. Be careful, they tend to stick. Add water if needed. Add the sugar and cook 15 minutes more, stirring often. Remove from heat and refrigerate overnight. You will have 2 1/2 cups peaches. Stir together the flour and salt. Using two forks, cut in the shortening. Add milk and stir. Separate into 8 to 10 portions. Using the extra flour and a rolling pin, roll each dough piece into a 6" round. Roll dough as thin as you can without tearing dough. Put 1-2 Tablespoons cooked peaches in the center of the rolled dough. Fold the edges over to make a half circle. Crimp edges with a fork. Trim off any extra dough. Melt lard in a medium-size frying pan. Grease should be quite hot before you fry jacks. 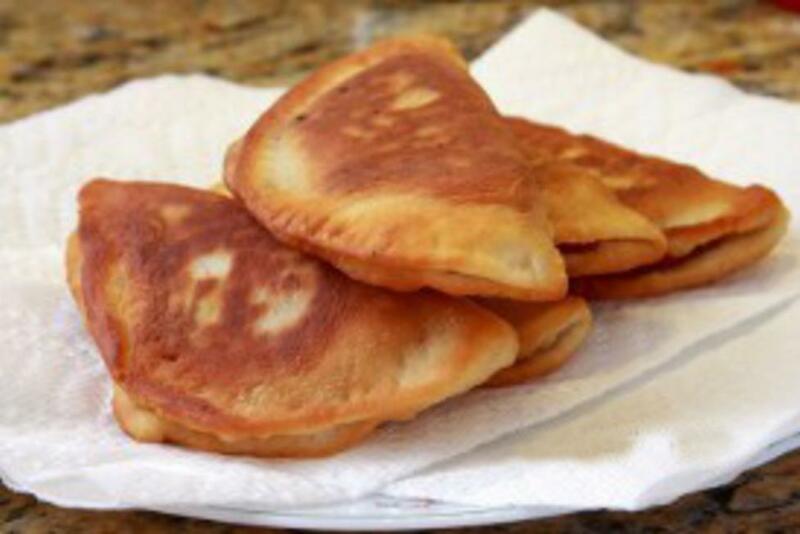 Fry jacks until they are golden in color. Turn and brown the other side. Remove from heat and drain on paper towels. Continue until all jacks are cooked.